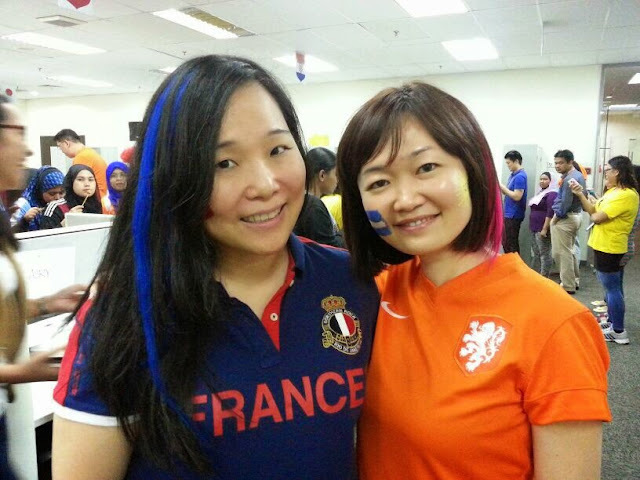 Our office is having our second World Cup themed event and this time I participated. I went to shop for a tee-shirt (I don't like to wear jerseys) and the selection at the store was limited and so I thought I'd just picked from what was available and settled for France. That was two weeks ago, and I am thankful France has qualified, or I'll be jeered at for donning a losing team's attire!...albeit just for fun. I am not a football fan, never was and never will, I suppose. But the camaraderie was great and it was fun. And I had a good time (though I spent most of the evening finishing off some work before settling for the weekend).